The history of pizza in Rome dates all the way back to the days of Caesar. But the spark in the popularity of pizza in Rome began much later. Around the 1940s, U.S. soldiers began importing a high protein flour from the states. Because of the higher protein ratio, the flour was able to absorb more water. In turn, a higher hydration meant lighter, airier pizza dough. The two types of pizza that are dominant in Rome are pizza tonda and pizza al taglio. At Mortadella Head, we’re huge fans of all styles of pizza, but we specialize in al taglio pizza for several reasons. Today, we’re breaking down the difference between the two types of Roman pizza dough and why we prefer it by the slice. The first pizza romana is tonda, meaning “round.” It has a very thin crust that won’t leave you with that full belly feeling. It is quite crisp — almost cracker-like — and very light to pick up. Tonda style pizza cooks very quickly. Because of its thinness, all of the elements (crust, toppings, and cheese) cook at the same time. They are typically cooked at a higher temperature than al taglio pizza and the increase in temperature creates a charred, bubbly crust. A simple style of this pizza is called a pomodoro: crust baked with tomato sauce and a little olive oil, then topped with fresh pecorino immediately after it comes out of the oven. Popular toppings include good tomatoes, anchovies, and mozzarella. Toppings tend to be more minimal; otherwise, the pizza will sag in the middle. 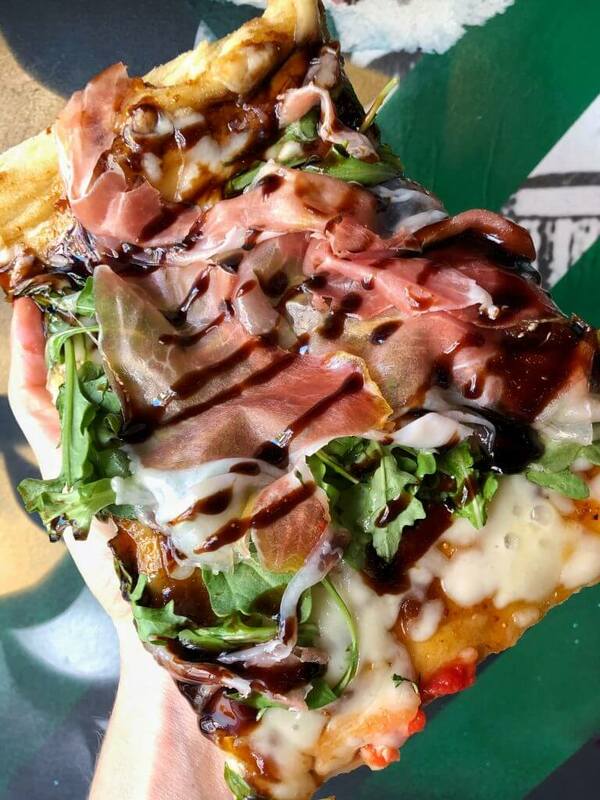 Now let’s talk about what we’re doing at Mortadella Head: al taglio pizza. Literally meaning “by the cut,” this cheap and easy street food is quite popular in Rome. Take a trip over to Italy and you’ll see people walking all around the city with a slice in their hands. Here in the United States, most of us know this type of pizza as sheet pizza. It can get pretty long in size — 3-4 feet or so in length and about 10-12 inches wide. Pizza al taglio is baked in a large rectangular pan and then cut into pieces to be purchased at the counter. 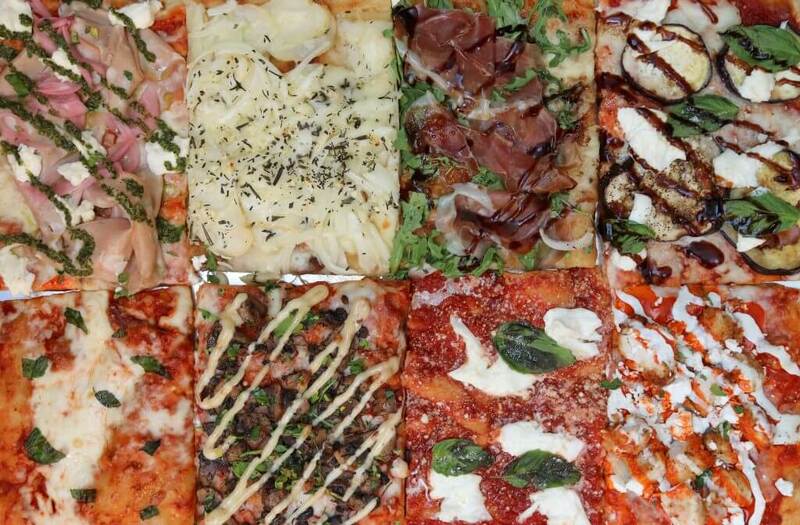 Over in Rome, all you have to do is point to the counter guy how big of a slice you’re in the mood for. He’ll cut it, wrap it up, and sell it to you by weight. A basic al taglio pizza has tomato sauce, oregano, and olive oil. Want something even more basic? Get a pizza bianca — similar to a thin focaccia with a layer of olive oil and a sprinkle of sea salt. More creative options include potato, eggplant, mortadella, and bruschetta. The crust of al taglio pizza is light and airy from the longer fermentation process. It’s got a great texture with a bubbly crust. The dough is baked between 500°F and 600°F, and then baked again after they are topped. This two-part cooking process creates a more evenly cooked pizza that’s pretty damn delicious.